An Associate in Information Technology degree gives students the knowledge and skills necessary to successfully meet the IT needs of a diverse array of employers. With nearly every facet of society, including large corporations, hospitals and health services, and schools, depending on the accurate functioning of information technology, qualified IT professionals remain in demand across the board. In a short span of time individuals can earn an Associate in Information Technology degree and apply their education professionally in a variety of entry-level jobs. This article ranks the best online Associate in Information Technology degree available today. What is an Associate in Information Technology Degree? How Long Does it Take to Complete and Online Associate in Information Technology Degree Program? What kind of job can I get with an Associate degree in Information Technology? What is the projected job outlook for individuals with a degree in Information Technology? Are there professional associations or organizations for those working in the field of Information Technology? David Batts is an Associate Professor in the Department of Technology Systems and the Bachelor of Science in Industrial Technology (BSIT) Program Coordinator at East Carolina University’s (ECU) College of Engineering and Technology. His research interests include workforce development, degree completion programs, distance education, and online instruction. Penn State World Campus ranks #1 on The Best Online Associate's Degree Programs in Information Technology! Penn State World Campus, the extended education wing of Pennsylvania State University, provides numerous online undergraduate, graduate, and professional program options in a diverse array of fields, including business, psychology, and information technology. Specializing in online education, Penn State World Campus meets the needs of nontraditional students of any background and from any location, offering valuable support services and resources. Penn State World Campus offers an online Associate of Science in Information Science and Technology degree program with four track options, including a Generalized Business option, a Networking option, and an Individualized option (developed with an advisor to meet personal interests and goals). The fourth option, a Baccalaureate track, serves students who intend to earn a bachelor's degree after completion of the associate degree program. Regardless of the path chosen, students develop a balanced foundation of knowledge and skills necessary for success in IT professions. The curriculum covers key aspects of the field, including database administration and data organization, networking issues and concepts, web design and development, technical analysis and troubleshooting, and effective technical communication. Students prepare to pursue a variety of careers, including database administrator, web developer, technical support specialist, or network administrator. Students in the online Associate of Science in Information Science and Technology program must also complete a team project, or an internship. Penn State World Campus is accredited by the Middle States Commission on Higher Education (MSCHE). University of Massachusetts, Lowell ranks #2 on The Best Online Associate's Degree Programs in Information Technology! The Division of Online Learning and Continuing Education at the University of Massachusetts, Lowell provides a wide variety of undergraduate and graduate programs, designed specifically to meet the unique needs of busy non-traditional students. The Division represents a diverse array of fields through flexible online programs, including criminal justice, mathematics, psychology, and information technology. The Division maintains a dedication to the academic and professional success of students through a variety of support services and resources. The Division of Online Learning and Continuing Education offers an online Associate of Science in Information Technology degree program for students seeking to enter IT professions. The program develops a balanced foundation of knowledge and skills necessary to success in the field. Through in-depth coursework, students engage with key IT concepts and practices, like assessing and trouble-shooting networks and IT systems, inspecting and implementing security systems, critical thinking and ethical decision making, programming in various languages, and utilizing common software and hardware. A large selection of elective coursework allows students to pursue niche interests in the field. Students prepare to pursue a variety of careers, including technical support specialist, information manager, and web developer, as well as further education. The University of Massachusetts, Lowell is accredited by the New England Association of Schools and Colleges (NEASC). Saint Leo University ranks #3 on The Best Online Associate's Degree Programs in Information Technology! Providing a variety of undergraduate and graduate programs, the Donald R. Tapia School of Business at Saint Leo University serves students of all levels of experience in business fields. The School of Business incorporates the Christian mission of Saint Leo University, with coursework covering Christian principles and history in each of its programs. The School of Business serves the needs of students through flexible online program options, internship and scholarship opportunities, professional development services, and access to the Center for Cybersecurity Education. The Donald R. Tapia School of Business offers an online Associate of Arts in Information Technology degree program designed to prepare students to enter a variety of IT professions. The program develops a balanced foundation of knowledge and skills necessary to the field. The curriculum covers key concepts, including programming in various languages, network design and trouble shooting, systems analysis, applying various theories, and clear communication of technical concepts. The program also incorporates a Christian worldview and principles, to prepare students to make important decisions from a Christian stance. Students emerge ready to pursue a variety of careers, including programmer, web developer, computer support consultant, and help desk analyst. Indiana Wesleyan University ranks #4 on The Best Online Associate's Degree Programs in Information Technology! With a variety of undergraduate, graduate, and professional programs, the DeVoe School of Business serves students of all levels of experience seeking professional advancement through education. In keeping with the mission of Indiana Wesleyan University, the School of Business integrates a Christian worldview and ethical principles into the core of its programs. Through flexible online program options, internship and scholarship opportunities, professional development services, and other resources, the DeVoe School of Business meets the needs of traditional and non-traditional students alike. The DeVoe School of Business offers an online Associate of Science in Computer Information Technology degree program designed to prepare students for entry level IT careers, as well as further education. The program covers IT fundamentals, developing foundational knowledge and skills necessary to successful IT practice. The curriculum emphasizes concepts like database development and administration, web design, hardware and software troubleshooting, and network communications. Additionally, the program develops a strong grounding in ethical decision-making based on Christian principles and a Biblical framework. Students prepare to enter a variety of careers, including technical support specialist, web developer, and help desk analyst. Students in the online Associate of Science in Computer Information Technology program must also complete a capstone project. The program utilizes a cohort model, with synchronous course delivery one evening per week. University of the Cumberlands ranks #5 on The Best Online Associate's Degree Programs in Information Technology! The School of Computer and Information Sciences at the University of the Cumberlands provides students with a variety of undergraduate and graduate program options for studying information science fields. Within the Department of Information Technology Sciences, students may focus their studies to the requirements of IT professions. The School serves students through a diverse array of program options, flexible online programs, scholarships, professional development services, and other resources. Through the University of the Cumberlands Online platform, the Department of Information Technology Sciences offers an online Associate of Science in Information Technology Sciences degree program for students seeking to enter IT professions. The program utilizes a balanced blend of courses covering IT fundamentals. Students develop the skills and knowledge necessary for key IT tasks, including database management, programming and coding, assessing and solving technological problems, and understanding and implementing hardware and software. Students emerge ready to pursue a variety of IT careers, including systems analyst, database administrator, web developer, programmer, and technical support specialist. University of Alaska, Fairbanks ranks #6 on The Best Online Associate's Degree Programs in Information Technology! Through eLearning and Distance Education, the University of Alaska, Fairbanks provides a variety of online undergraduate and graduate degree and non-degree programs. Dedicated to the success of busy, non-traditional students, eLearning and Distance Education provides flexible options for education, as well as valuable resources, including internship and scholarship opportunities. The University of Alaska, Fairbanks offers an online Associate of Applied Science in Information Technology degree program with three concentration options, in Computing Technology, Network and Cybersecurity, or Network and System Administration. Through a blend of core and concentration coursework, the program provides students with general and specialized knowledge and skills in the field. The program includes thorough coursework, as well as in-depth research or hands-on work experience. The curriculum covers fundamental aspects of IT professions, including assessing and implementing IT systems, technical troubleshooting and critical thinking, providing support services, database development, and network security. Students prepare to pursue further education in the field, as well as entry-level careers like media technician, help desk analyst, and network support technician. Students in the online Associate of Applied Science in Information Technology program must also complete an independent project, or cooperative work experience. The University of Alaska, Fairbanks is accredited by the Northwest Commission on Colleges and Universities (NWCCU). Florida State College at Jacksonville ranks #7 on The Best Online Associate's Degree Programs in Information Technology! One of four schools at Florida State College at Jacksonville, the School of Technology and Industry provides a variety of undergraduate programs for students seeking to enter technological fields. Maintaining a dedicated focus to the professional success of students, the School offers flexible online programs, internship and scholarship opportunities, professional development services, and other resources. The School of Technology and Industry offers an online Associate of Science in Computer Information Technology degree program with three career track options, including a Programming Track, a Web Track, or a Database Track. The program blends in-depth coursework with hands-on field experience through an internship. Students develop a strong foundation of knowledge and skills, through general coursework, as well as specialized coursework relating to their chosen career track. Students enhance their ability to successfully perform key roles in the field, including database development, technical support, problem solving with software and hardware, data security, and computer communications. Students prepare to pursue a variety of entry-level IT positions, such as IT specialist, web development specialist, or database development specialist. Students in the online Associate of Science in Computer Information Technology program must also complete a 50-hour internship. The accelerated program may be completed in 20 months. Florida State College at Jacksonville is accredited by the Southern Association of Colleges and Schools Commission on Colleges (SACSCOC). Franklin University ranks #8 on The Best Online Associate's Degree Programs in Information Technology! The College of Arts, Science, and Technology at Franklin University provides a variety of undergraduate and graduate programs in diverse fields, including psychology, interactive media design, and information technology. Building on Franklin University's century of experience in adult education, the College serves traditional and non-traditional students alike, with flexible online program options, professional development services, and other valuable resources. The College of Arts, Science, and Technology offers an online Associate of Science in Information Technology degree program for students seeking to enter IT professions. The program develops a balanced foundation of knowledge and skills necessary to successful IT practice in a variety of settings. The curriculum focuses on fundamentals of the field, including understanding a variety of IT systems, assessing and implementing new systems and tools, technological problem solving and critical thinking, ethics, configuring networks, network and data security, and programming. Students emerge ready to enter a variety of positions, including computer support specialist, web developer, IT specialist, and systems administrator, as well as future education in the field. Franklin University is accredited by the Higher Learning Commission (HLC). Southern New Hampshire University ranks #9 on The Best Online Associate's Degree Programs in Information Technology! Through the College of Online and Continuing Education, Southern New Hampshire University provides busy non-traditional students with flexible program options for earning their degrees. With a diverse array of fields of study, professional development services, and numerous online resources, the College maintains its mission of ensuring professional success through higher education. The College of Online and Continuing Education offers an online Associate of Science in Information Technologies degree program designed to prepare students for success in the IT field. The program emphasizes technical problem solving and critical thinking skills, assessing and implementing IT systems, maintenance of existing IT systems, utilizing new tools, and effective technical communication to non-technical audiences. Through a balanced set of courses, students develop a strong foundation of knowledge and skills necessary to IT professions. Students emerge ready to pursue a variety of entry-level positions, such as systems administrator, IT specialist, and technical support specialist, as well as further education. Colorado Technical University ranks among The Best Online Associate's Degree Programs in Information Technology! With a variety of undergraduate, graduate, and professional programs, the College of Business and Management at Colorado Technical University serves students of all levels of experience. In addition to its on-campus programs, the College provides flexible online program options, professional development services, and other resources to aid students in achieving professional success. College of Business and Management offers an online Associate of Science in Information Technology degree program for students seeking to enter IT professions. The program develops the skills and knowledge necessary for success in the IT field. Students become proficient with operating contemporary information technology tools and systems, troubleshooting and problem solving, coding and programming, and applying IT systems in diverse business settings. The curriculum covers an even range of IT fundamentals, designed to provide students with a strong foundation for professional practice. Students prepare to pursue a variety of careers, including desktop support technician, computer support specialist, and help desk analyst, as well as future study in the field. Colorado Technical University is accredited by the Higher Learning Commission (HLC). Herzing University ranks among The Best Online Associate's Degree Programs in Information Technology! With origins as a computer-training institute, Herzing University has offered educational programs since 1965. Herzing University has since expanded to offer degree and non-degree programs across ten campuses and an online platform, Herzing Online. With a wide variety of career-oriented programs, professional development services, and other valuable resources, Herzing University serves the educational and professional needs of traditional and non-traditional students alike. Herzing University offers an online Associate of Science/Associate of Applied Science in Information Technology degree program for students seeking entry-level positions in the IT field. The program provides a focused study of key aspects of IT professions. Students develop the skills necessary for technological problems solving, applying information systems to collect and deliver data, applying industry standards to their professional practice, and conveying their knowledge to non-technically audiences. The curriculum includes coursework in such topics as programming logic, computer architecture, computer networks, and database concepts. Students prepare to enter careers such as computer network support specialist, media technician, web developer, and help desk analyst. Herzing University is accredited by the Higher Learning Commission (HLC). Keiser University ranks among The Best Online Associate's Degree Programs in Information Technology! Founded in 1977, Keiser University enrolls over 20,000 in undergraduate, graduate, and professional programs, on multiple campuses as well as online. With plenty of flexible program options, as well as professional development services and student resources, Keiser University provides students with plenty of help toward future success. Through its Fort Lauderdale Online Division, Keiser University offers an online Associate of Science in Information Technology degree program for students seeking to enter the IT field. The program prepares students to perform key tasks of IT professionals. Through balanced, hands-on coursework, students engage with IT fundamentals, such as assessing and trouble-shooting networks and IT systems, inspecting and implementing security systems for data protection, critical thinking in theory and practice, and ethical decision making. Students prepare to pursue further education in the field, as well as entry-level careers like media technician, help desk analyst, and network support technician. Peirce College ranks among The Best Online Associate's Degree Programs in Information Technology! With over 150 years of experience to its name, Peirce College provides students with a variety of undergraduate and graduate programs dedicated to professional success. Peirce College serves traditional and non-traditional students with a healthy blend of on-campus and online programs, credit options for prior learning, work experience, and military experience, professional development services, and a variety of other valuable resources and benefits. Peirce College offers an online Associate in Information Technology degree program for students seeking to enhance their skills and enter the field. The program utilizes a balanced blend of courses covering IT fundamentals. The curriculum develops key knowledge to IT professions, including network security, database management systems, ethics and legal concerns, problem solving and critical thinking, networking, programming, and HTML. Students prepare to enter bachelor's degree programs in information technology, as well as a variety of IT professions, including programmer, web developer, computer support consultant, and help desk analyst. Peirce College is accredited by the Middle States Commission on Higher Education (MSCHE). Purdue University Global ranks among The Best Online Associate's Degree Programs in Information Technology! With a variety of undergraduate and graduate degree and non-degree programs, Purdue University Global serves students seeking to enter diverse professional fields. The School provides numerous online program options, flexibility, dynamic interaction, and other useful resources, serving traditional and non-traditional students alike. Purdue Global offers an online Associate of Applied Science in Information Technology with concentrations in IT generalist, networking, or multiplatform software development. The program is for anyone interested in becoming an information technology professional, but needing to enhance their skills and knowledge before seeking employment. Purdue Global's program is designed to provide the general education, applied knowledge, and technical skills relevant to a range of entry-level positions. Student will study how to install and maintain computer and wireless networks, troubleshoot hardware and software problems, create Java applications, manage databases, and develop web pages. Strayer University ranks among The Best Online Associate's Degree Programs in Information Technology! With numerous campuses and students worldwide, Strayer University specializes in providing non-traditional students with career-focused educational programs in a variety of fields. Founded in 1892 as a business school, the programs at Strayer build on over a century of experience in higher education. A large selection of online programs, professional development services, and other resources provides student with the tools for future success. Strayer University offers an online Associate of Arts in Information Technology degree program that provides students with in-depth experience in key aspects of the IT field. Students develop the skills and knowledge necessary to solve a range of IT infrastructure problems. The curriculum covers topics like designing, evaluating, and implementing IT systems, identifying user and company technological needs, understanding ethical and legal issues in the field, and best practices and standards. Students prepare to pursue further education in the IT field, as well as entry-level positions, like network support technician, media technician, and computer support consultant. Strayer University is accredited by the Middle States Commission on Higher Education (MSCHE). An Associate in Information Technology degree prepares students to meet the needs of a variety of entry-level IT professions. Typically requiring 60 credit hours, these programs include coursework in fundamental aspects of information technology, as well as general education coursework, and sometimes hands-on work experience or in-depth projects to develop a well-rounded, functional education. The programs emphasize the development of knowledge and skills in such areas as technical troubleshooting, database administration, assessing and implementing systems, and clear communication of technical concepts to non-technical audiences. Individuals holding an Associate in Information Technology degree may also choose to pursue a bachelor's degree program later. 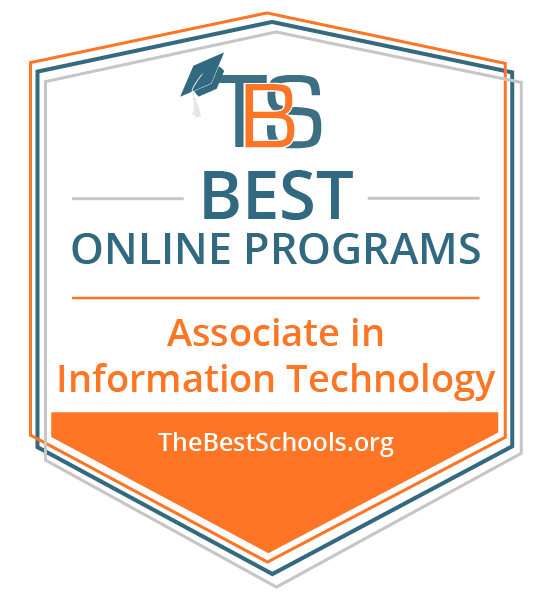 Like most Associate programs, an online Associate in Information Technology degree program typically requires two years of study for completion, though some accelerated programs can be completed in a shorter time frame, such as 18 months, or even one year. From 2014-2024, the Bureau of Labor Statistics (2016) expects the information technology field to grow much faster than average for all occupations, with a sizable expansion of 12%. Dating back to the earliest days of the Information Technology field, a collection of IT professionals formed CompTia AITP in 1951. With thousands of members in chapters spread across the country, the AITP serves seasoned professionals, academics, and students alike, through advocacy, services, and establishing professional and ethical standards. Benefits include educational and training services, access to professional publications and resources, events and conferences, and a large professional network. More information can be found at their website. Formed in 1947, the development of the ACM parallels the development of the concept of Information Technology as a field. Composed of nearly 200 chapters worldwide, the ACM dedicates itself to advancing the field through research, distributing information, advocating for professional interests, and fostering connections. ACM members benefit from access to a variety of resources, awards and recognition opportunities, networking, and events and conventions. More information can be found at their website.